INDIANAPOLIS – Professionals strive to be the best in their respective fields. Some attain that goal, while others don’t. Pat Dumoulin is one who did. For the first time in his 31 year career as a licensed IHSAA basketball official, the Kokomo native was selected to officiate a boys state championship game. 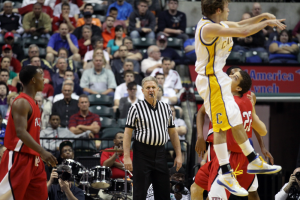 And not just any game, the IHSAA asked him to work the biggest game of all – the Class 4A state finals. Dumoulin is actually no stranger to the basketball state finals – this is the second consecutive year he has called a hoops title game, but his specialty may be considered the girls game. He is a three-time state girls championship game official, having been selected for Class 4A in 2005 and Class 2A in 2002 and 2011. But it is the boys game that has the biggest draw, and he had the opportunity to work with two elite programs as Carmel and Pike squared off at Banker’s Life Fieldhouse, with the Greyhounds winning its first state title since 1977 by downing the Red Devils 80-67. An ironic thrill for Dumoulin was the opportunity to call the title bout in front of his former high school basketball coach. Carl McNulty, a member of the Howard County Sports Hall of Fame and former hoops mentor at Kokomo High School, traveled to Indy from his retirement home in Florida. But Dumoulin was quick to point out McNulty was not in town to cheer on one of his former pupils. As it turns out, his grandson, Karl Schneider, is a senior starter for the state champion Greyhounds. One thing Dumoulin does not worry about is the constant barrage of insults that are directed his way when he puts the whistle to his mouth. As with any occupation, hard work and patience paid off for Dumoulin. He said he works between 35 and 40 combined boys and girls games per year, and he donned the black and white stripes for the first time in 1981. But he says getting the boys state finals was not necessarily on his radar. The seasoned official said he has not decided on his officiating future. With 31 years and more than 1,000 games under his belt, he knows his days on the court are numbered. But regardless of what is next in his black and white stripes future, one thing is for sure – with four state championship games to his name, he is one of the best to ever blow the whistle, and he has represented Kokomo well. This entry was posted in Basketball, IHSAA. Bookmark the permalink.